Which Renal Transplant Candidates Should Accept Marginal Kidneys in Exchange for a Shorter Waiting Time on Dialysis? Renal transplantation has been established as a life-saving procedure for patients with ESRD. Deceased donor kidneys convey variable life expectancies for recipients. However, limited information is available to guide patients and patient advocates concerning the appropriateness to list for expanded criteria donations (ECD). Half-lives for wait-listed transplant candidates were estimated from the time of ESRD onset on the basis of recipient age, primary diagnosis, and organ quality using survival models. In addition, we evaluated the likelihood of candidates’ receiving a transplant on the basis of age and other characteristics by duration of waiting time. Older patients (65+) had longer life expectancy when they accepted an ECD within 2 yr of ESRD onset (5.6 yr) compared with waiting for a standard kidney (5.3 yr) or a living donation (5.5 yr) after 4 yr of dialysis. Conversely, younger recipients (18 to 39 yr) had longer life expectancy with a living donation (27.6 yr) or standard kidney (26.4 yr) after 4 yr on dialysis compared with an ECD after 2 yr of dialysis (17.6 yr). 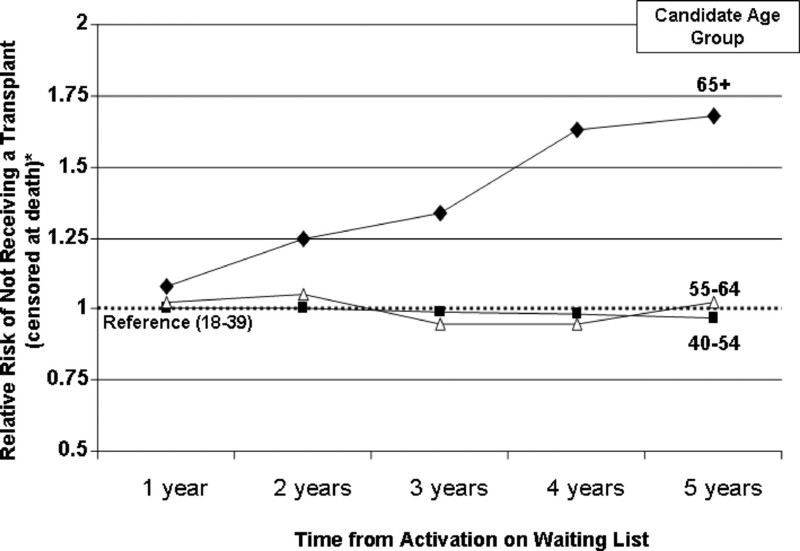 Increased candidate age was associated with the likelihood of not receiving a transplant during the period on the waiting list as a result of mortality and separately related to morbidity and delisting. Older and frailer transplant candidates benefit from accepting lower quality organs early after ESRD, whereas younger and healthier patients benefit from receiving higher quality organs even with longer dialysis exposure. These findings are important for transplant candidates and advocates decision-making and for potential further implementation in allocation policy. Renal transplantation has been established as a life-saving procedure for patients who have ESRD and have been medically cleared for the surgical procedure (1). Furthermore, the beneficial effects of transplantation are observed among patient subgroups, including higher risk patients such as those with high body mass index levels and older adults (1,2). Research suggests that even certain candidates who are older than 70 yr may be viable for the procedure and enjoy the benefits of transplantation, including extended life expectancy (3). 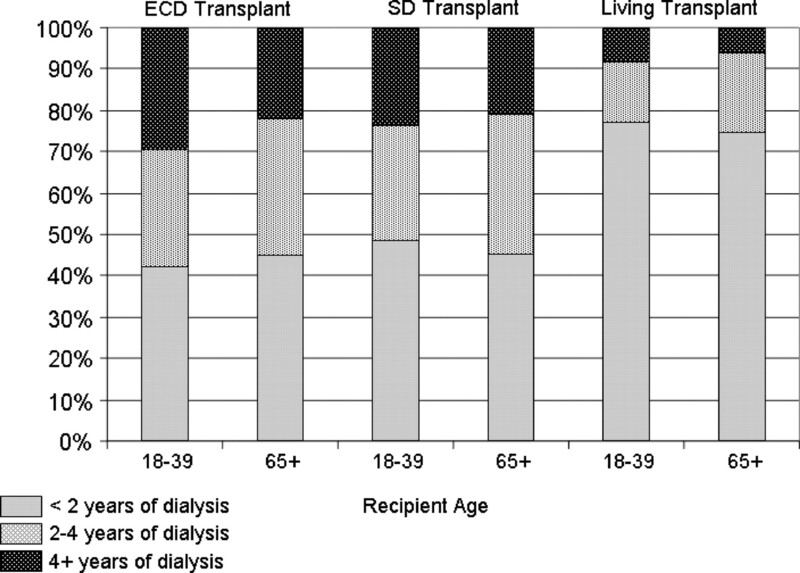 The notion that transplantation is efficacious relative to remaining on maintenance dialysis also likely has increased the demand for placement on the waiting list. Dialysis promotes the development of cardiovascular disease, osteodystrophy, and anemia among other potential long-term deleterious effects (4,5). Furthermore, the duration of dialysis has been shown to have a significant impact on outcomes after transplantation (6–11). In addition, transplantation has been shown to halt cardiovascular insults that are attributed to dialysis (12). This cumulative evidence may suggest that patients should be strongly motivated to acquire a transplant as early in the ESRD process as possible. However, the advantages of kidney transplantation are based on population studies, and patients may have a wide array of circumstances when confronted with the need for a kidney transplant. There are multiple procedural, donor, and recipient factors that are potent modifiers for the average advantage of kidney transplantation. One of the strongest predictors of graft and patient survival in deceased donor renal transplantation is the quality of the donor organ (13,14). A varying constellation of factors, most notably the age of the donated organ, ultimately define the quality of a graft and convey highly variable life expectancies for the prospective transplant recipient. A patient who has ESRD onset and is eligible for transplantation is presented with therapeutic options, including seeking a living donation and, if placed on the deceased donor waiting list, whether to accept lower quality organs. The Organ Procurement and Transplantation Network instituted a formalized definition of marginal kidneys in 2002 with the advent of the Expanded Criteria Donor (ECD) (15,16). These deceased donor kidneys were demonstrated to convey a 70% or greater risk for graft loss for transplant recipients relative to an ideal donation and were characterized by a donor age older than 60 yr or older than 50 yr and accompanied by two additional risk factors, including a history of hypertension, elevated terminal donor creatinine, and cerebrovascular cause of death. Standard donor (SD) kidneys are classified as all deceased donor kidneys that do not meet the ECD definition. The decision to list for an ECD kidney is often strongly influenced by transplant physicians and other patient advocates. Most notable, among deceased donations, the choice of whether to accept an ECD kidney in lieu of further time on dialysis in anticipation of an SD kidney is a common and difficult decision. Research suggests that quality-adjusted life years (QALY) may be suboptimal for some patients who accept an ECD kidney early in the ESRD process (17). Using Markov decision modeling, this article concluded that the “break-even” point for patients to achieve equivalent QALY when accepting ECD kidneys in exchange for waiting time on dialysis was substantial and varied among the population. In this analysis, we investigated whether certain patient groups may benefit by delaying transplantation of an ECD kidney early in the ESRD process in favor of potentially receiving an SD kidney with additional time on dialysis on the basis of the patient’s overall life expectancy. In addition, we sought to characterize the historical timing and allocation of kidneys in certain patient populations and examine the potential opportunity to evolve allocation policy to use these findings. As such, we undertook an analysis of all adult solitary renal transplant candidates and recipients who were registered in the United States from 1995 to 2004. We examined survival rates for all adult patients (>18 yr of age) on the waiting list and receiving dialysis for a solitary kidney transplant and for those who received a transplant from 1995 to 2004 and were documented in the Scientific Registry of Transplant Recipient database. 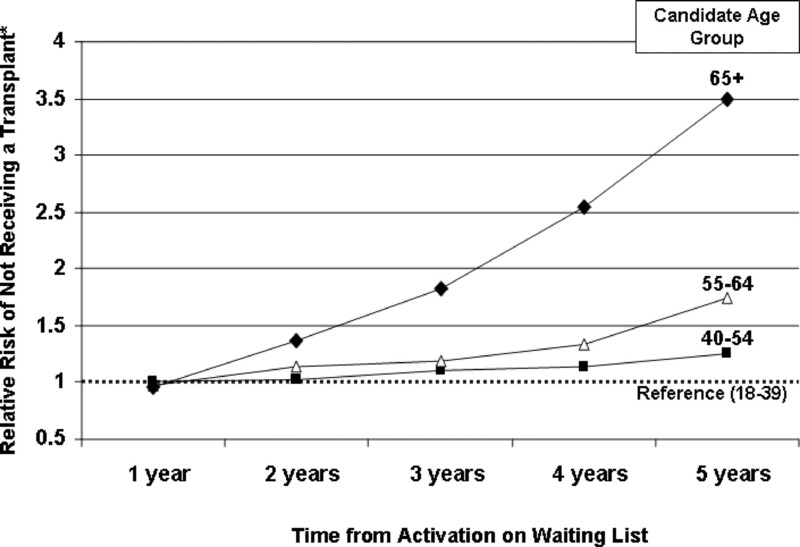 Patients were followed from the time of dialysis initiation while on the waiting list for a transplant or from the time of transplantation in the case of preemptive transplants. Patients were considered on an intent-to-treat basis, and removals from the waiting list were not censored. In addition, waiting list survival models were censored at the time of transplantation. We used the Organ Procurement and Transplantation Network–defined ECD delineation as an indication of organ quality and examined the impact of the organ quality on survival rates within candidate age groups using Kaplan-Meier and regression models (15,16). To estimate the half-life for patients, we used a piecewise model in which we calculated 1-yr survival estimates for study groups and appended the applicable death rate from a regression model that assumed a constant rate of decline from 1 to 6 yr posttransplantation (18). We also estimated the 95% confidence intervals (CI) for the time to half-life on the basis of projections of the survival distribution function of upper and lower confidence bounds. The piecewise model was chosen to project half-lives for which actual follow up to 50% survival was not available and to use a stable portion of the survival curve. We estimated survival expectancies for transplant patients separately for those with <2 and 2 to 4 yr of pretransplantation dialysis on the basis of the donation type and candidate age group. These estimates incorporated the applicable death rate on dialysis and posttransplantation as a function of the donor type. We also examined the impact of organ quality and waiting time in patient subsets of patients with diabetes and black patients, who have significant variations in prognosis on dialysis (19,20). We constructed a multivariate logistic model for the response variable of listing for expanded donors as indicated in the database. Finally, we generated logistic models in annual intervals after wait listing to assess the association of candidate age with the likelihood of transplantation from a deceased donor. These models were adjusted for candidate primary diagnosis, panel reactive antibody level, race, gender, and receipt of a previous transplant. For each model, patients who had had a transplant in a previous interval (i.e., the likelihood of a transplant at the third year of listing excluded all patients with a transplant within 2 yr) were excluded. We repeated this for SD kidneys alone and by excluding six-antigen matched transplants. Last, we constructed models censored for death (i.e., patients must have been alive for the entire applicable year) to estimate the contribution of morbidity or de-listing toward the probability of transplantation. All analyses were performed on SAS v. 9.1 (SAS Institute, Cary, NC). 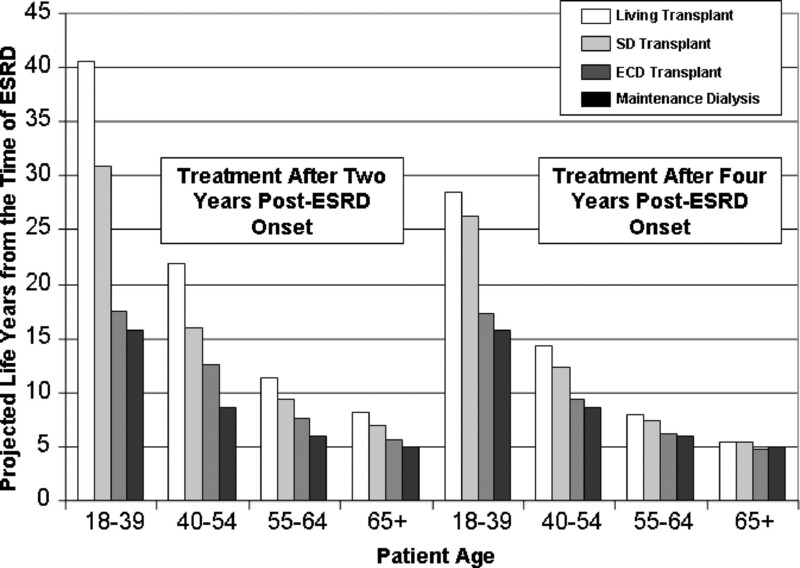 Figure 1 depicts the projected survival for patients from ESRD onset as a function of treatment modality and recipient age, calculated for patients with up to 2 yr and 2 to 4 yr of pretransplant dialysis. Importantly, these estimates do not display life expectancies conditioned on survival to the applicable vintage but are strictly calculated from the time of ESRD onset while on the waiting list. On the basis of these estimates, younger patients (aged 18 to 39 yr) had significantly longer life expectancy with a living donation (27.6 yr; 95% CI 23.5 to 34.0) or an SD kidney (26.4 yr; 95% CI 22.4 to 27.5) after 4 yr on dialysis as compared with patients who received an ECD kidney with 2 yr of dialysis (17.6 yr; 95% CI 13.8 to 19.3). However, in older recipients (65+), the life expectancies when an ECD kidney was received after 2 yr on dialysis (5.6 yr; 95% CI 5.1 to 6.5) were comparable to an SD kidney (5.3 yr; 95% CI 4.8 to 6.0) or living donation (5.5 yr; 95% CI 4.7 to 6.5) after 4 yr of dialysis. Other age groups (40 to 54 and 55 to 64) also had similar life expectancies with an ECD kidney at 2 yr after ESRD onset as with an SD kidney at 4 yr. 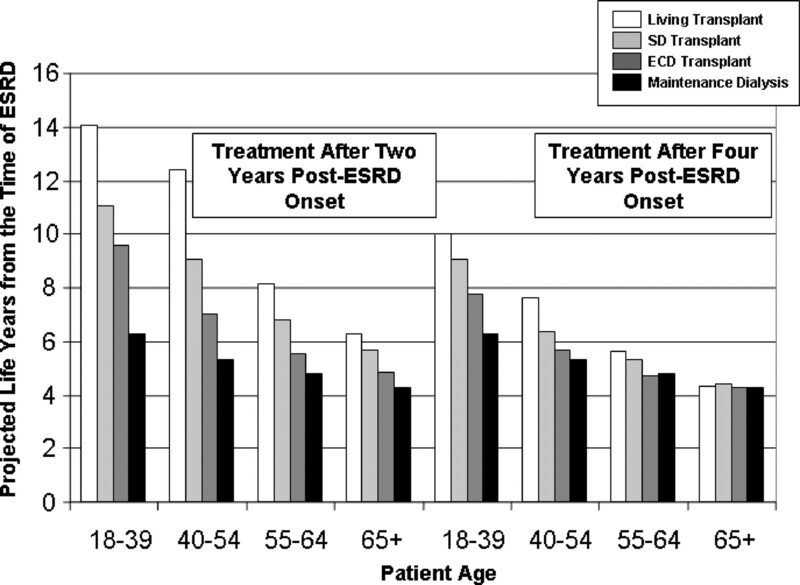 Projected life expectancy after ESRD onset by recipient age and treatment modality. Life expectancies are calculated from time of ESRD onset and incorporate the mortality rates associated with years of dialysis and organ quality. SD, standard deceased donor transplant; ECD, expanded criteria deceased donor transplant. Patients with a primary diagnosis of diabetes had significantly reduced survival expectancies relative to the overall cohort (Figure 2). For this subset of patients, the projected survival for patients with an ECD kidney transplant at 2 yr after ESRD onset was at least as long as fro those who accepted an SD kidney and had up to 4 yr of pretransplantation dialysis. Patients who were aged 18 to 39 (with a projected half-life of 6.3 yr on dialysis) and received ECD kidneys at 2 yr had a projected survival of 9.6 yr, which was similar to those who received an SD kidney at 4 yr (9.0 yr). For black patients, survival rates were higher on dialysis across age groups as compared with the overall cohort. The estimated difference in survival associated with an ECD kidney at 2 yr after dialysis versus receiving an SD kidney at 4 yr in the youngest group was pronounced (18.4 versus 27.7 yr, respectively). Within the oldest recipients, there was a similar estimated survival for patients with an SD kidney at 4 yr (6.3 yr) and an ECD kidney transplant at 2 yr (6.0 yr). Projected life expectancy after ESRD onset by recipient age and treatment modality for patients with diabetes as the primary cause of ESRD. Life expectancies are calculated from the time of ESRD onset and incorporate the mortality rates associated with years of dialysis and organ quality. The timing of transplantation over the course of dialysis was similar for both younger and older patients across the type of the transplant. As displayed in Figure 3, of all ECD donations that were accepted by younger patients, 42.1% were accepted within 2 yr of dialysis initiation. For SD kidneys, 48.5% were transplanted within 2 yr and 77.1% of living donations were accepted in the first 2 yr of dialysis. For older patients, this distribution was similar, with 44.8% of ECD donations accepted within 2 yr of dialysis initiation. For patients with diabetes, 42.6% of all ECD kidneys were transplanted within 2 yr of dialysis while patients were on the waiting list, and for patients without diabetes, 40.3% of ECD kidneys were transplanted within 2 yr.
Distribution of donor kidney type by pretransplant dialysis in older and younger patients. Overall, 47.5% of candidates were listed on an expanded donor list. Results from the logistic model, displayed in Table 1, indicated that increased age, black race, elevated peak panel reactive antibodies, and diagnoses of diabetes and hypertension were particularly associated with an increased likelihood of listing for an expanded donation. In addition, other race groups (relative to white) and women were less likely to be listed for an expanded donation. Neither candidate’s level of education nor previous transplantation was associated with listing for an expanded donation. Figure 4 displays the adjusted likelihood for a deceased donor transplant for candidates by age and time on waiting list. The probability of transplantation within 1 yr of listing was relatively equivalent by candidate age. This result was consistent when six-antigen matched transplants were eliminated. However, as waiting time accumulated, the relative likelihood of a transplant for older candidates diminished. The relative odds of not receiving a transplant at 5 yr for those who were 65 yr and older was 3.5 (95% CI 2.8 to 4.3) compared with 18- to 39-yr-olds. Candidates who were aged 40 to 54 (adjusted odds ratio [AOR] 1.26; 95% CI 1.15 to 1.37) and 55 to 64 (AOR 1.74; 95% CI 1.55 to 1.96) also had a significantly reduced likelihood of transplantation at 5 yr. Candidates who were 65 yr or older had a reduced likelihood of receiving an SD kidney within 1 yr (AOR 1.28; 95% CI 1.20 to 1.37). These candidates had more than a four-fold risk for not receiving an SD kidney at 5 yr (AOR 4.6; 95% CI 3.5 to 5.9). Other factors that were associated with a decreased likelihood of transplantation at 5 yr were female gender (AOR 1.15; 95% CI 1.06 to 1.25), previous transplants (AOR 1.43; 95% CI 1.27 to 1.62), and primary diagnoses of diabetes (AOR 2.60; 95% CI 2.29 to 2.95) and hypertension (AOR 1.28; 95% CI 1.14 to 1.44). Black race (AOR 0.79; 95% CI 0.72 to 0.86) and other race groups (AOR 0.75; 95% CI 0.65 to 0.85) were more likely to receive a transplant in this interval. Older patients also had a progressively lower likelihood of transplantation through the waiting list period, including a 68% increased odds (AOR 1.68; 95% CI 1.28 to 2.21) of not receiving a transplant relative to 18- to 39-yr-olds at 5 yr as a result of causes other than death (Figure 5). Relative risk for not receiving a deceased donor kidney transplant once placed on the waiting list by candidate age. Reference group is 18- to 39-yr-olds; model additionally adjusted for candidate primary diagnosis, race, gender, previous transplant, and panel reactive antibody (PRA) level. Relative risk for not receiving a deceased donor kidney transplant once placed on the waiting list by candidate age (censored for death). Reference group is 18- to 39-yr-olds; model additionally adjusted for candidate primary diagnosis, race, gender, previous transplant, and PRA level. Patients were included only when they were alive for the full applicable wait listing year. The data in Table 2 illustrate the unadjusted rate of transplantation by waiting list vintage for patients with the given amount of follow-up time. Older recipients had a slightly higher rate of transplantation within the first year of being placed on the waiting list. Subsequently, older candidates had reduced rates of receiving a transplant relative to their younger counterparts. Overall, approximately 58% of older recipients did not receive a transplant within 6 yr as compared with 49% of 18- to 39-yr-old candidates. The primary finding of our analysis is that older patients and patients with diabetes should have a particular impetus to receive a transplant early after wait listing. As such, early transplant evaluations, even before ESRD onset, are critical for high-risk patients. For these patients (and likely generalized to other patients with accelerated death rates on dialysis), the potential benefits that are associated with an SD are negated when it comes at the expense of additional years of dialysis. This result is related directly to the high and increasing mortality of these patients on dialysis and, consequently, to the reduced chance to survive until or be eligible for the transplant procedure when an organ becomes available. Conversely, younger patients have a substantial potential gain in life years by waiting on dialysis for an SD rather than accepting an ECD kidney earlier in the waiting list period. The deleterious impact of pretransplantation dialysis is apparent in all patients; however, the relative benefit of transplantation with an SD seems to supersede these effects in younger patients. Therefore, passing up an ECD kidney for the prospect of an SD kidney later in the waiting list process seems to be a viable option and almost imperative for patients with longer life expectancy. In contrast, this option often would be futile for patients with a short life expectancy. From an allocation perspective, given the current waiting times for deceased donor organs, the distribution of ECD kidneys to older recipients early in the waiting list period and delayed transplantation of SD to healthier patients may be the most efficient model of resource utilization and survival optimization for all patients. For patient advocates, our results support encouraging healthier patients to avoid acceptance of ECD kidneys on the basis of long-term survival. During the study period, 1142 ECD transplants for patients who were 18 to 39 yr of age occurred within 4 yr of ESRD onset; concurrently, 1020 older candidates died on the waiting list before 4 yr. This suggests a relatively equivalent magnitude of patients who may benefit from altering their therapeutic course associated with the timing and type of transplant while potentially extending long-term outcomes. Furthermore, the rate of organ discard for ECD kidneys, although improving, remains substantial, and further identification of potential recipients of ECD kidneys may have a marked effect on broadening the use of viable organs (21,22). A similar model, aimed at increasing the utilization of older donors and reducing waiting time for older recipients, is already being used in the voluntary Eurotransplant Senior Program (23). Early results indicated that the program had potential to meet these goals, particularly in conjunction with reduced cold ischemic time (24). Our analysis does not suggest that patients who have already survived years on dialysis would not benefit from transplantation (most surprising, they still do) but rather that from the time of ESRD onset, the prospect of long waiting times for SD kidneys does not seem to be a viable option for certain candidates. According to the findings by Schnitzler et al. (17), there are notable tradeoffs in QALY by accepting ECD from the patient perspective. Of primary importance, beyond economic considerations, our results indicate that survival expectancies are markedly varied on the basis of patients’ therapeutic course. One of the concerns of the current policy is that as patients progress on the waiting list, by the time they are offered an ECD kidney, they also often are highly ranked to receive an SD, thus the “tradeoff” for diminished waiting time is minimal. However, if this barter were more substantial in terms of the amount of waiting time avoided, then there seem to be opportunities to reduce risks in a substantial portion of the population. A model in which older patients can substantially reduce their waiting time with receipt of ECD also seems to represent an efficient utilization of resources as well as avoid sacrificing life years (25). This may be facilitated on several levels: Continued dissemination of these issues to patients and patient advocates, preferential allocation of SD to healthier patients, or using completely separate waiting lists for ECD candidates. Further opportunities also likely would exist using more granulated definitions of donor quality matched with more specific evaluations of a candidate’s prognosis on dialysis. The results of the analysis also reemphasize the importance of seeking a living donor, as the estimated impact on survival are significantly elevated over deceased donor transplants in all patients. As reported by the 2002 conference on the waiting list for kidney transplantation, other indicators, such as diagnosis of diabetes, limited vascular access, and unsensitized patients, also may be applicable candidates for ECD transplants (26). For patients with diabetes, our analysis indicates that early transplantation is imperative among all candidate age groups. However, black patients, who have decreased mortality rates on dialysis, seem to have increased benefit when they are selective regarding organ quality. Despite this, black patients historically have listed more frequently for and received lower quality deceased donor organs relative to white patients (24). Certainly, in addition to life expectancy calculations, patient affinity for dialysis and quality of life are important considerations. Most patients’ quality of life is improved after transplantation, but in certain situations, complications and other undesired outcomes can change this perception. However, objective realities are informative and should be made available to transplant candidates and health care professionals to assist in potentially life-altering decisions that affect the entire ESRD population and medical community. Given the high and increasing mortality and morbidity of older patients on the waiting list, naturally the probability of receiving a transplant diminishes over time. This was particularly evident in older candidates who were awaiting SD. Even when the analysis is censored for death, older recipients have reduced likelihood of transplantation by waiting list duration. This is likely reflective of morbidities as well as patients who are withdrawn from the waiting list (either literally or for all intents and purposes). This reemphasizes the notion that older (and frailer) candidates have incentive to acquire a transplant early in the waiting period rather then continue to await a standard organ or linger on the waiting list with minimal chance of actually receiving a transplant once it becomes available. Caution always must be exercised when life expectancy projections are extrapolated many years beyond the span of available data. There may be a late decline in survival associated with graft loss or retransplantation, particularly in younger patients, that occurs outside the period of this study, which affects the estimates that we presented. In the same manner, the lasting effects of dialysis in the younger population simply may not be observable within our study period. Moreover, many additional factors affect patient prognoses beyond age, race, and primary diagnosis and could potentially contribute to survival estimations. In addition, a multitude of potential confounding factors may explain organ selection decisions beyond the scope of our analysis. As regions have variable expected waiting times, our results represent only a national perspective. For centers with extended waiting times or for patients with type O blood, the magnitude of our estimates and the relative balance between organ quality and duration of dialysis likely would shift. As such, the interpretation of our findings likely is not in the exact estimates and must be placed in the perspective of the patient’s particular circumstances. Individual prognosis on dialysis has an important interaction with the choice of treatment modality for patients with ESRD. In general, higher risk patients have a very limited prognosis waiting for SD with extended time on dialysis. In contrast, healthier patients benefit from waiting longer for SD even with prolonged exposure to dialysis. This consideration is valid only because of the organ shortage and extended waiting times. Living transplantation voids all of these considerations, and for patients who are fortunate enough to have a living donor, preemptive transplantation remains the optimal choice. Portions of these analyses were presented at the Transplant Summit, San Francisco, October 26 to 28, 2005; and the meeting of the American Society of Nephrology, Philadelphia, November 8 to 13, 2005. The data reported here were supplied by the University Renal Research and Education Association as the contractor for the Scientific Registry of Transplant Recipients. The interpretation and reporting of these data are the responsibility of the authors and in no way should be seen as an official policy of or interpretation by the Scientific Registry of Transplant Recipients or the US government. Institutional review board approval or exemption determination is the responsibility of the authors as well. You are going to email the following Which Renal Transplant Candidates Should Accept Marginal Kidneys in Exchange for a Shorter Waiting Time on Dialysis?